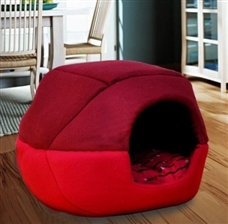 Your dog will love to play and relax in this gorgeous indoor pet house. The Double Sided Sponge Dog House is fun and trendy looking to satisfy your pet's natural curiosity. The cover material of this soft dog house is velvet and the lining material of this comfortable dog house is sponge. Half of the house can be removed during summer seasons. This indoor house is sure to make your pet feel secure and pampered.